Start with the artichokes, removing the outer leaves and the tip. Put them in a bowl with water and lemon so as not to make them black. Chop the shallot and fry it in a saucepan with 4 tablespoons of extra virgin olive oil, add the artichokes and let them cook slowly. Add 1 glass of white wine halfway through and let evaporate. Season with salt and pepper, then finish cooking artichokes covering the pot for 5-10 mins, until they are tender. While the artichokes are cooking, prepare the béchamel. Heat the milk and add salt and nutmeg. Slowly melt the butter in a saucepan and add the flour. Mix quickly with a whisk to avoid lumps. Add the hot milk, salt and continue to mix until it becomes dense. Cut into pieces scamorza and mozzarella. Put 2 tablespoons of extra virgin olive oil and béchamel in a baking sheet. 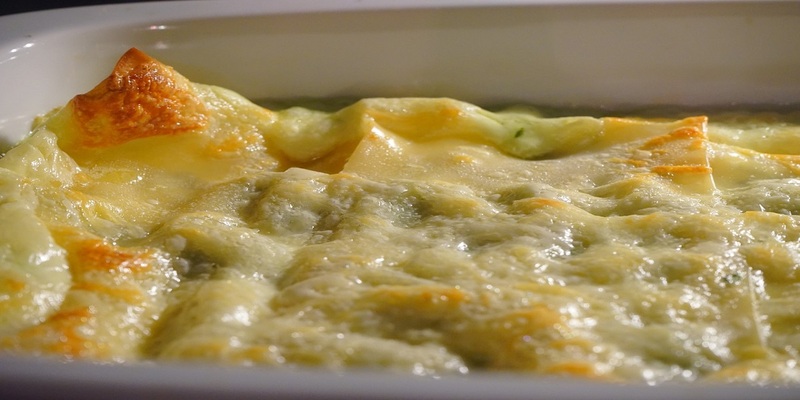 Lay the first layer of lasagne and cover it with artichokes, grated Parmigiano and the other cheeses. Cover with béchamel sause and Parmigiano and continue with the layers.